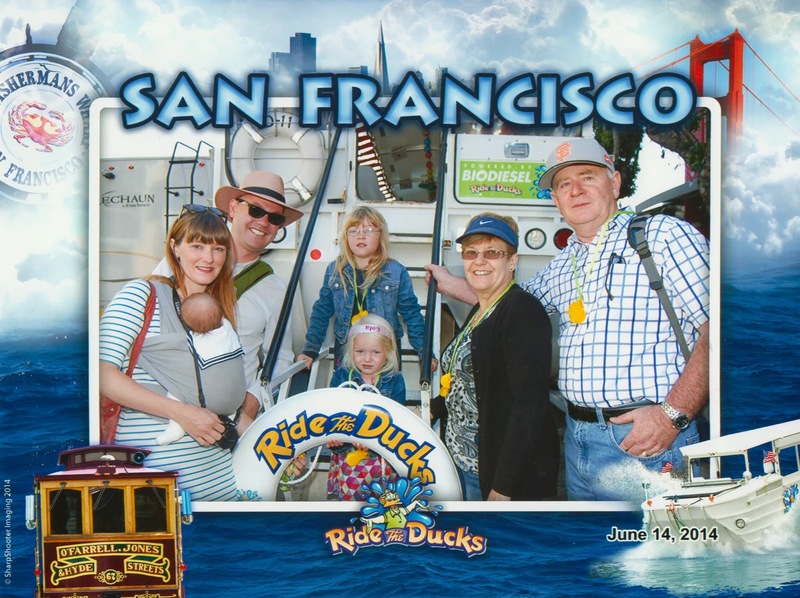 Our 90 minute long adventure started when we boarded the amphibious bus at Fisherman's Wharf. Before we even hit the road the girls were noisily quacking away on their Wacky Quackers. Apologies to anyone whose ears they may have deafened as they competed against each other to see who could make the loudest noise! Our tour took us past many "must-see" destinations in San Francisco with a very informative, and entertaining, commentary from our driver. Or rather, our captain. From our starting point at Fisherman's Wharf we headed up the hill past Ghirardelli Square, caught a glimpse of Lombard Street's crooked section, headed through the Italian neighbourhood of North Beach and made our way down bustling Stockton Street in Chinatown. We then headed through the Financial District, past Yerba Buena Gardens, through the start-up neighbourhood of SOMA and made our way to the waterfront next to Pier 50. Time for splash down! Edging our way down the boat ramp and into the water was the strangest feeling. One minute we were driving along the street, the next we were floating on the water. Once on the water the kids were given the chance to drive the Duck. It's not every day you get to drive a bus on the water so the girls were pretty excited about this - although Ava was a little worried she might crash into something or make us sink! As luck would have it, she didn't crash or sink us and we spent an enjoyable time taking in the views as we floated around McCovey Cove. The nautical part of our tour was everyone's favourite part. The views over the city and Bay Bridge from the water were spectacular. I always love seeing San Francisco from a new vantage point. We also got a pretty great view of the deconstruction of the old East Bay Bridge. See that gap in the bridge in the photo below? That's where they've started taking the old bridge apart. It's pretty amazing seeing the two ends of the bridge with a gaping hole in the middle! As we cruised past AT&T Park the girls hoped that a Giants player would hit a "splash hit"; a home run hit that lands in the water. We were a little early for the game though so no luck this time. It would be pretty amazing to see from the water though. And of course, there was plenty of noisy quacking coming from our family with our Wacky Quacker kazoos! Somehow Mathilde managed to sleep through all that noise. I guess she takes after her big sister Lola who fell asleep when we took part in the Easter Parade with Ride the Ducks back in April. Oh, and before anyone asks; yes, I did dress my baby in a sailor suit for the boat ride! Cheesy, I know but I couldn't resist. I mean, it went perfectly with my nautical stripes! Before we knew it we were heading back up the boat ramp and back to being a regular bus - well, as "regular" as an amphimbious bus can get! Time sure does fly when you're having fun. Back on dry land we headed past AT&T Park which was abuzz with pregame activity. Our drive back towards Fisherman's Wharf took us past Yerba Buena Gardens and the Moscone Center, through the financial district again, past the historic Jackson Square and along the Embarcadero with its many wharves. Our adventure with Ride the Ducks was the perfect way to explore the city and have a little fun along the way. Ava and Lola enjoyed the trip so much that they now hope to take all of our future visitors for a ride on the duck as well. If you're looking for a fun, family friendly experience in San Francisco I couldn't recommend Ride the Ducks enough. It's a wonderful experience for visitors and locals alike; no matter what the age. For further information and to book tickets visit Ride the Ducks San Francisco here. My wife Sherril and I and our grandson Casey rode the Ducks with some friends yesterday. What a blast!